Republican Delegate Eric Porterfield is under fire after using a gay slur and invoking the Ku Klux Klan while lobbying against LGBTQ+ protections. The passing of anti-discrimination amendments protecting LGBTQ+ folx in some West Virginia cities has generated some… discrimination. State Democrats had introduced an anti-discrimination bill to protect LGBTQ+ West Virginians. To counter, Republicans introduced a measure to keep in place any laws cities had passed that would have allowed anti-LGBTQ discrimination. In a debate over the bills, Republican delegate Eric Porterfield from Mercer County, West Virginia, invoked a certain gay conservative pundit, and called “the LGBT” community “socialists,” “terrorists,” and “a modern day version of the Ku Klux Klan,” The Charleston Gazette-Mail reports. “The LGBT [sic] is the most socialist group in this country,” Porterfield said during a House Government Organization Committee session on Wednesday. “They do not protect gays. There are many gays they persecute if they do not line up with their social ideology.” He then cited Milo Yiannopoulos and said the word f*gg*t during an official session by referencing the controversial writer’s 2017 speaking tour. Committee Democrats condemned Porterfield’s comments in a Thursday session. Jake Zuckerman with the Charleston Gazette-Mail followed up with Porterfield by phone on Friday. “The LGBTQ is a modern day version of the Ku Klux Klan without wearing hoods with their antics of hate,” Porterfield told Zuckerman. He also called the LGBTQ+ community a “terrorist group,” and said that he’s getting angry messages on Facebook and his voicemail for his actions on Wednesday. Keep in mind this is all, somehow, lobbying to repeal LGBTQ+ protections — an effort that ultimately failed, thanks to committee Democrats and Republican delegates Eric Nelson, Tony Paynter, and Joe Jeffries. Curious about how this veritable force for good in politics came about? Yeah, same. Back in December, Porterfield made headlines for being the second blind member of the West Virginia House of Delegates. Tucked beneath notes about his blindness and church philanthropy, though, the born-again Baptist missionary is revealed to have a distinctly messy background. In 2016, Porterfield decided to run for office after harassing his family’s OB-GYN to the point of receiving a restraining order. He reportedly saw a Facebook post by the doctor that supported abortion, which prompted Porterfield to run a smear campaign and threaten a boycott if the doctor didn’t flip her stance on abortion access. The altercation ended in the confiscation of the Porterfields’ firearms, which were later returned. Porterfield also cited conversion therapy as a reason for wanting to run. After a 2018 bill to prevent the harmful practice on LGBTQ+ youth was killed, he said he felt the need to stand up for freedom of speech, according to the Gazette-Mail. “To tell someone they cannot counsel from a certain perspective without offering certain behaviors is just ludicrous,” he said. “I don’t understand how anyone could be that bigoted and discriminatory.” Of course this isn’t an issue of speech — the American Psychological Association has condemned conversion therapy for years, as an ineffective, harmful practice. 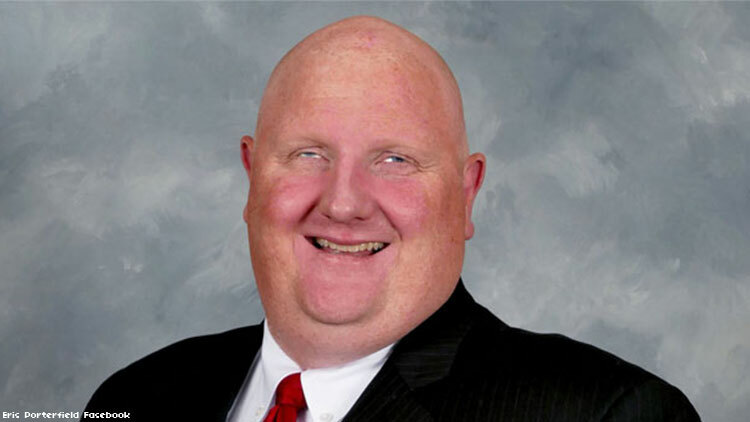 While it may be incredibly difficult to resist the temptation to laugh Porterfield off as a crazy Southern politician engaging in crazy antics, his actions affect legislation for vulnerable LGBTQ+ people. Luckily, the legislation he lobbied for so ludicrously was killed before it left the floor, but West Virginia has not a single state-recognized non-discrimination policy on the books, and the state actually ranks in the negative for its treatment of gender identity, according to Movement Advancement Project. That means local legislation is vital protection for queer West Virginians.